(Nanowerk News) This technology is significant as it allows the thermally durable Li-ion battery to be used in a wider variety of applications, such as large-scale industrial machines with motors, and medical machines which need to be heated for autoclave sterilization. Since this technology does not require the cooling system common in conventional Li-ion batteries, it is expected to lead to further developments of compact battery systems and reduce overall costs. The high energy density Li-ion battery is already being used as power sources in applications such as portable devices (smartphones and tablets), electric vehicles and adjustor of the supply and demand of renewable energy. 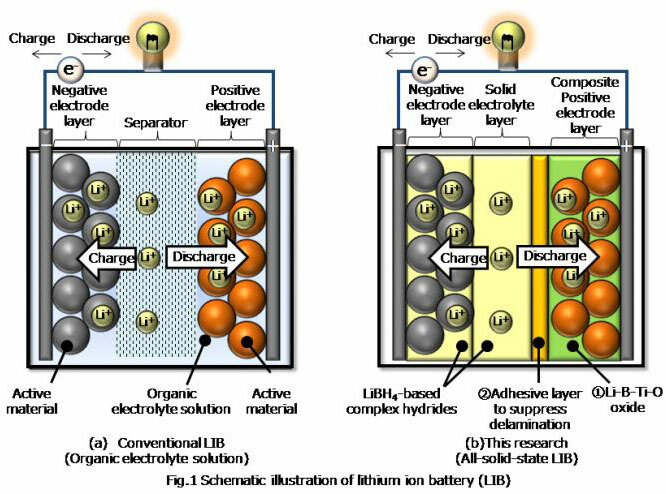 The conventional Li-ion battery consists of a separator, a positive electrode layer and a negative electrode layer (Fig.1 (a)). The battery is filled with organic electrolyte solution in which lithium ion conducts between the two electrode layers during the charge and discharge process. 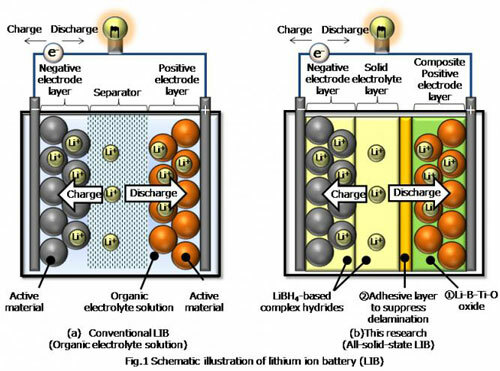 An issue of the conventional Li-ion battery, with the organic electrolyte solution, is thermal durability. The upper operating temperature is limited to around 60°C owing to volatility of the organic electrolyte solution. Consequently, it is difficult to use the conventional Li-ion battery in a high temperature environment without a cooling system. Therefore, the solid electrolyte with no volatility has been developed for the utilization of Li-ion battery in a high temperature environment. The lithium ion conductivity of solid electrolyte, however, is lower than that of the organic electrolyte solution, and the internal resistance of all-solid-state Li-ion battery should be reduced for its commercialization. Prof. Shin-ichi Orimo's lab in AIMR and the Institute for Material Research at Tohoku University have been conducting research on LiBH4-based complex hydrides as novel and solid electrolytes. They have confirmed the fast lithium ion conductivity in the wide temperature range from room temperature to 150°C.